You need to store and also display your valuables in good place if you have collecting hobbies. There is a acrylic display box or acrylic display case can suit you whatever collections you possess. There are display boxes which are specially made to hold jewelleries, model cars, basketball, football, bottles and other valuable possessions. There are various display cases for you choosing. If you need a sturdy and affordable display box for your collections, then acrylic display boxes are the best choice due to its high transparency and light. It can fit whatever it is you would like to put inside. Acrylic display boxes have many sizes, shapes and designs. You must take enough time to look for one that fit your collections perfectly. You are welcome if you plan to customized the acrylic display boxes if you need a large amount of the boxes. Before ordering your display box, you have to know what is the size of your collections at first,then you know the approximate size of display cases. And secondly, you should know where to put the display case so that people can easily notice it. You want to showcase your collection proudly to your guests. You can choose to place your display cases in your living room or dining room. Otherwise, you can just put your display inside your bedroom or your private library. 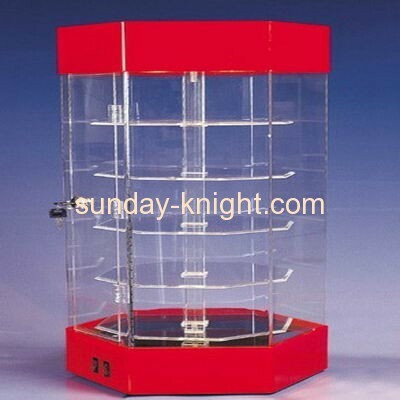 Acrylic display cases are perfect for your collections since it is quite easy to clean. The display box will keep your collections safe and dust-free at the same time. If your collections are very expensive, you can make your acrylic display cases with a key and lock, other person can't touch your valuables without your permit.